In Minnesota there is much fun family entertainment. As a comedy magician I love to bring the amazing magic tricks to young and old alike. Adults laugh and say they enjoyed the show more than the kids. Part of the fun is to see the kids get involved in the magic tricks and then the adults laugh as they enjoy the children’s reactions to the magic. This past Christmas season the magic show once again was presented at the MSP Airport for the Pilots for Kids Program. The organizer said the show was fantastic. and one pilot said he always looks forward to the magic and that the party would not be the same without me. That makes me happy. An entertainer’s main goal is to delight the audience and make them want to see more. The MN Goldie Gopher helped me do three magic tricks for the children. It was so fun to bring some laughs with this icon of MN Sports. But Santa was on his way from the North Pole and everyone is thrilled to see the jolly old elf. The Twins Bear was there too an and Goldie the U of MN Gopher even helped do three tricks int he show. If you need a fun show for your event please call. I recommend many fun magicians, jugglers, comedians, and musicians for family events at schools, churches and festivals. Please check our website for more detail on the entertainment for special events. I can recommend many fun shows that will delight your next family gathering. Magic brings life to the party. I was also pleased to return to the Toro company party again this year for the 8th year. They had face painters, fun party games and of course Santa. It is fun to see the families get their pictures with Santa at this party. Goldie the Gopher delights the kids with his crazy antics. When you need magic shows in St. Paul give a call. We bring comedy family entertainment to parties in Minneapolis and Bloomington. Many schools have a family night magician perform for the students and parents. This brings everyone together for a fun community activity. Here is a link that shares some family night ideas. A magical snowman adds laughs and surprises to the family friendly magic show. It is easy to make a quick 10 minute phone consultation. Lots of people enjoy texting but something like entertainment should be investigated much deeper. It is good to actually speak to the person who will be entertaining at your event. It is hard to discover the fun personality of your performer if you only text. The right entertainer will make your next event sparkle and be very memorable. Your families will enjoy amazing magic tricks and fun comedy in Minneapolis and across Minnesota. 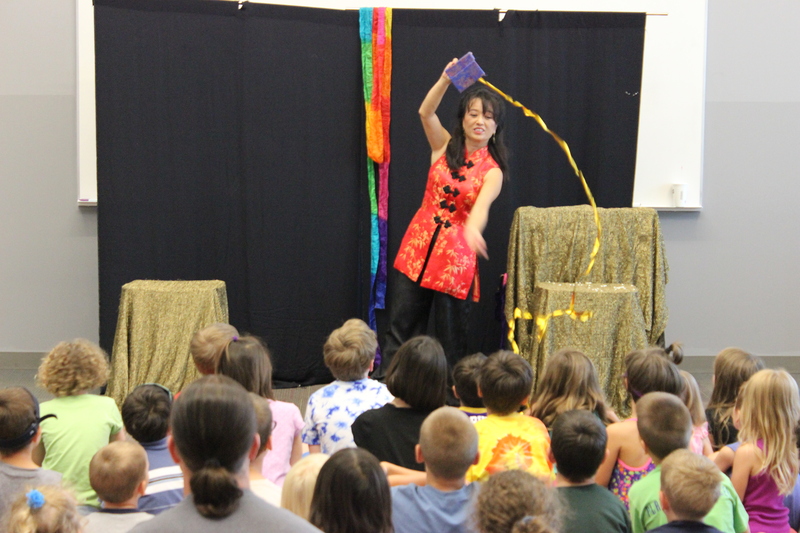 The kids enjoyed the amazing magic show at the St. Paul Library.